Building bridges of understanding and awareness. Most people have difficult emotions arise in their lives from time to time. 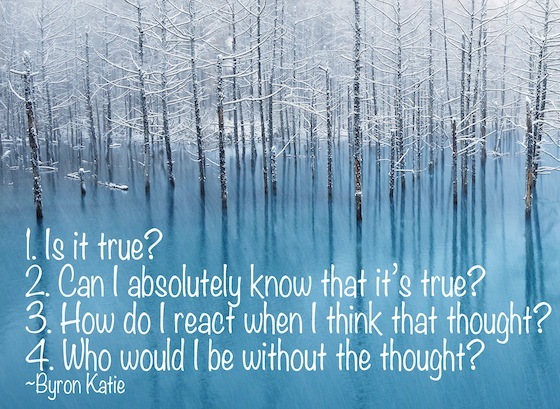 The Work, a process created by Byron Katie, is a simple and powerful means of inquiry that teaches us to identify the thoughts that cause our suffering (anger, fear, depression, addiction) and then question them. It is a way to understand what’s hurting you and to address the cause of your problems with clarity. It requires nothing more than a pen, paper, and an open mind. When we want something to be different than it is, we’re fighting with reality and, ultimately, frustration and stress settle in. The Work, as a practice, is a way of holding up our stressful thoughts to four questions and Turn Arounds (seeing how the opposite of a thought could also be true). Once we introduce inquiry or The Work to our stressful thinking, our lives are never the same again. You can learn more about the Work by attending one of my workshops and by visiting thework.com.